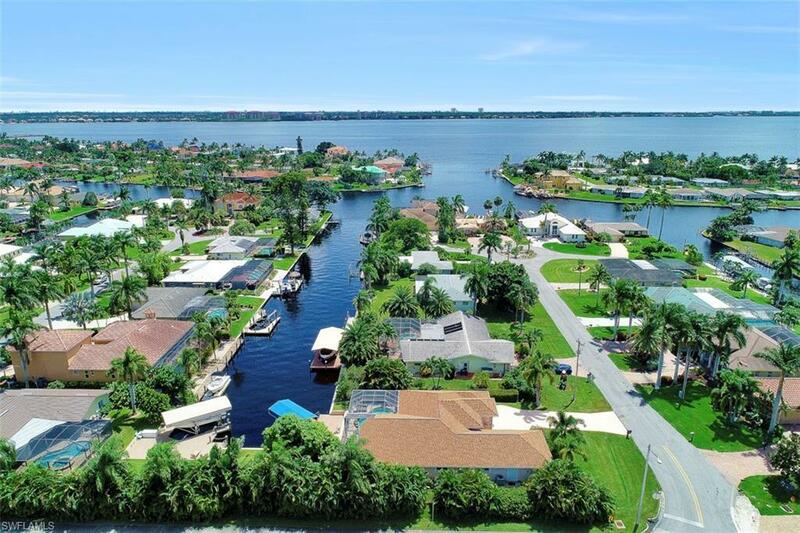 5607 Coronado Ct, Cape Coral, FL.| MLS# 218058450 | Southwest Florida Residential Real Estate for Sale. Direct Access Pool Home located minutes from the River in the Yacht Club. Featuring 4 bedrooms 2 full bathrooms and a heated waterfront pool with saltwater system. River views from the dock! Minutes from open water via private dock with captains walk and 7, 000-pound boat lift. Separate family and living rooms both with exceptional water views. High cathedral ceilings and lots of windows for an open feeling throughout. Open kitchen with newer stainless-steel appliances. Large master bedroom overlooking the water! Master bath features dual sinks, walk-in shower, and his & her walk-in closets. Generously sized spare bedrooms each with closets, share a full bathroom. Lots of under truss area for entertaining pool side! Sweeping heated pool with water fall, water views, and patio area to sun bath! Paver walk-way leads to the composite wrap-around dock with lift, newer lighting, pilings, and water/electric at dock. DIRECT ACCESS straight out from you back yard! NEW ROOF 2018, and AC, hot water heater, faucets and appliances new in 2010. Electric and manual storm shutters! Perfect place to call home, vacation home, or vacation rental property! Minutes from Cape Coral Beach. Selling Office: Gulf Gateway Realty, Inc.